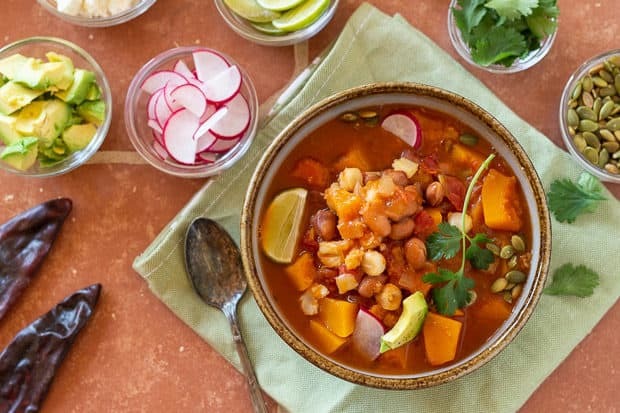 Sweet buttery squash in a rich chile-seasoned tomato broth, with creamy pink pinto beans and white hominy corn, all enlivened with an array of colorful garnishes, this healthy vegetarian butternut squash pozole is bursting with spicy flavor and toothy texture! 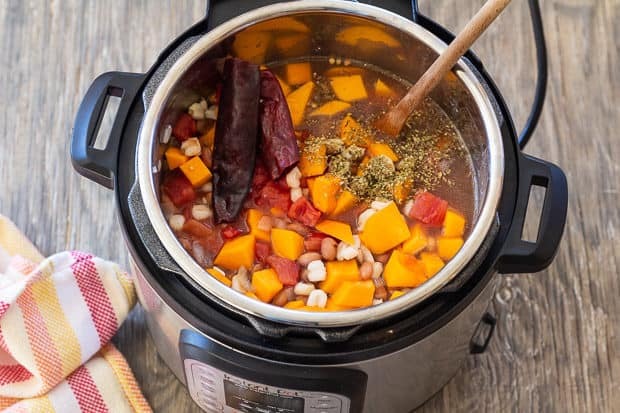 Click here to PIN Instant Pot Butternut Squash Pozole! Vegetarians, vegans, and those wanting to eat less meat, rejoice–we have butternut squash pozole!! This pozole begins with sautéed onions, garlic, vegetable broth, dried red chiles, and diced canned tomatoes. The toothy hominy, cooked pinto beans, and diced butternut squash go in the pot and and are simmered together until the squash is tender. Simple. 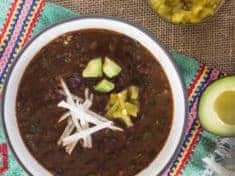 The classic and essential garnishes for pozole, sliced fresh radishes, toasted pumpkin seeds, cubes of avocado, and chopped cilantro, accent this stew-soup’s warm flavors, all in all making for a nourishing Mexican-inspired meal! 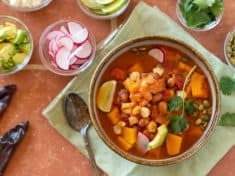 Using a pressure cooker or Instant Pot, you can cook butternut squash pozole in 20 minutes flat. That’s 5 minutes for it to come to pressure, 5 minutes cook time, and 10 minutes natural pressure release! Without a pressure cooker, plan on 30 minutes stovetop or until the butternut squash is tender. 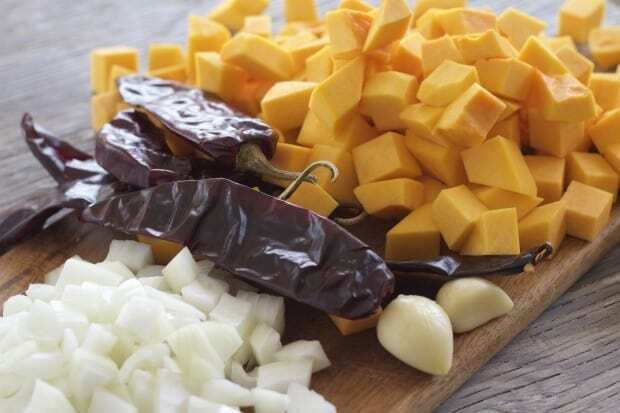 While the soup simmers, under pressure or regular stovetop, prepare the add-ins, including lime wedges for squeezing into the soup at the very end. Arrange everything in separate bowls, so, at the table everyone can add the condiments to suit their own taste. For those who eat dairy, offer salty cotija or feta cheese crumbles. If you like crunchy, put out a bowl of crispy tortilla chips too. You can make butternut squash pozole the day before. It freezes and reheats well. Prepared ahead, keep your pozole hot in the Instant Pot or slow cooker and you’ll enjoy cocktail hour feeling totally together! Pozole, aka posole, is a Mexican soup/stew that always includes the large chewy kernel corn known as hominy. Typically, pozole is made with pork, or sometimes chicken. Vegetarians, vegans, and those wanting to eat less meat will love this version of pozole. Pozole, posole? Sometimes recipes will spell pozole with an S, posole. In Spanish the letter Z sounds like our English S. Any way you spell it, pozole is pronounced po-so-lay. This butternut squash pozole would be considered a red pozole because it’s seasoned with smoky dried red chiles. A green pozole would include tomatillos and fresh green chiles, while white pozole is straightforward brothy, and served with ample shredded cabbage. Just so you know, some of the links below are affiliates. When you purchase products via my links, it doesn’t cost you anything and I earn a tiny commission, which helps me continue to provide free content here on Letty’s Kitchen. Thank you!! Hominy corn kernels have the husk and germ removed and they’re larger and more chewy than sweet corn. Hominy is so inherent to pozole that in Mexican markets you’ll sometimes see fresh hominy in air-tight packages labeled pozole. Canned hominy is readily available so that’s what I use in this recipe. When ground, the white hominy kernels are called hominy grits and the ground yellow kernels are coarse cornmeal, or polenta grits. BTW–You’ll love the hominy corn in this flavorful Greens and Potato Soup! Trim the ends off the squash, then cut it in half crosswise. Place the squash halves cut side down and using a sharp knife, slice away the peel, down to the orange flesh. Cut the peeled squash in half lengthwise. Scrape out the seeds. With the lengthwise cut side down, slice ¾-inch thick. Finally, cut those slices in ¾-inch chunks. *** You can substitute frozen butternut squash cubes for fresh cut. Dried guajillo chiles have smooth maroon-colored skins. They measure 4 to 6 inches long, about 1 3/4 inches wide. Look for packaged guajillo chiles in Mexican food markets or well-stocked grocery stores. Packages of dried guajillo chiles generally have more than the 6 chiles needed for butternut squash pozole. What else can you do with dried red chiles? Make homemade authentic red enchilada sauce. 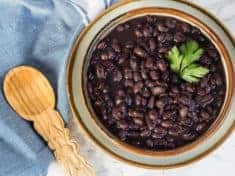 Make easy chile chocolate mole sauce. 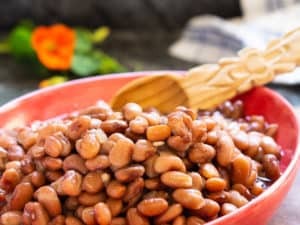 Throw a dried red chile or two into the pot when cooking homemade pinto beans. Place all the ingredients in the slow cooker. Cover and cook on High for 8 hours. Make it a fabulous week–get in the kitchen and cook something nourishing and delicious! 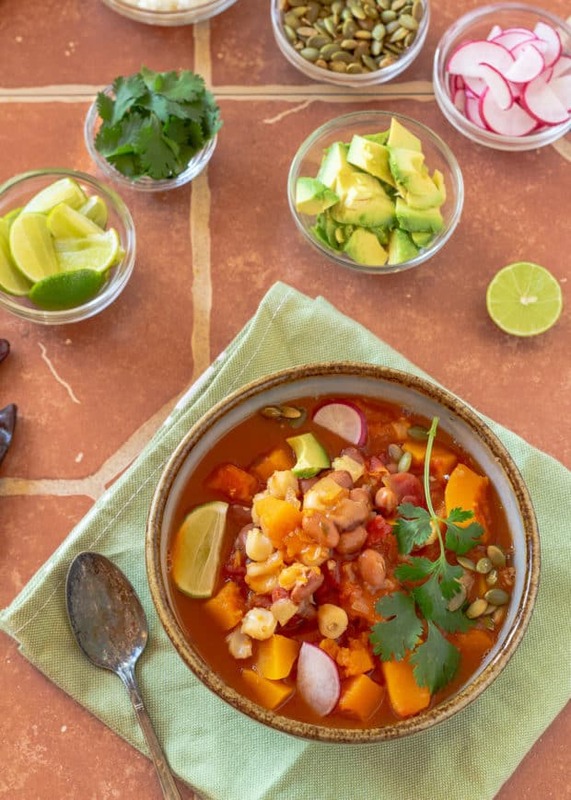 Buttery squash in a rich chile-seasoned tomato broth, with creamy pinto beans and hominy corn, all enlivened with an array of colorful garnishes, this healthy Mexican-inspired vegetarian butternut squash pozole is bursting with spicy flavor and toothy texture! Perfect for family or parties. Heat the olive oil in the pressure cooker over medium heat. If using the Instant Pot, press the Sauté button. Add the onion and garlic and cook until the onions are soft and translucent. Break the top stem from the chiles and discard. Shake away any seeds that fall easily out of the chiles, but don’t fuss getting them all out. Rinse the whole chiles and add them to the onions and garlic. Stir in the tomatoes, butternut squash, vegetable broth, hominy, beans and oregano. Close the lid. Using the Instant Pot, set the top valve to Sealing. Press Cancel and then press Manual. Adjust the time for 5 minutes. Using the stovetop pressure cooker, bring to pressure and cook 5 minutes. With the Instant Pot, let the pressure release naturally for 10 minutes, then turn the top valve to Venting to release the rest of the pressure. For stovetop pressure cookers, remove from heat and let the pressure release naturally for 10 minutes, then run cold water over the lid to release any remaining pressure. While the pozole simmers prepare the add-ins, including lime wedges. Arrange everything in separate bowls, so, at the table everyone can add the condiments to suit their own taste. Carefully remove the chiles from the soup. Discard the chiles. Adjust the seasoning to your taste with salt and red pepper flakes. Ladle the pozole into large bowls. At the table, let everyone squeeze a lime wedge or two into their bowl and garnish as they wish, with cilantro, pumpkin seeds, radishes, and avocado. If desired, offer crumbled cheese and/or tortilla chips. You can substitute frozen butternut squash cubes for fresh cut. Feel free to substitute black beans for the pintos. Nutrition information is an estimate and does not include the add-in garnishes.